It is almost impossible to separate S U R V I V E from the Netflix series Stranger Things nowadays, such is the perfect intertwining of the music with the visuals in both atmosphere and period. This album, recorded in 2015 and released in 2016, has the sense of the soundtrack as it too is built with period analog synths, but it is definitely a cohesive whole rather than collected pieces written for the scenes it played alongside. I would find it impossible to get to the end of this without mentioning Tangerine Dream, which is clearly true as I just did. I’ve listened to Tangerine Dream, the earlier stuff, a lot, and I can hear them in this album and in much of the S U R V I V E catalogue, be it there intentionally or not. These are no creators of pastiche though, this is original music that I find to be eminently listenable and, put quite simply, I have become a bit of a fan, having three of their releases as well as the 3 Stranger Things Soundtracks. 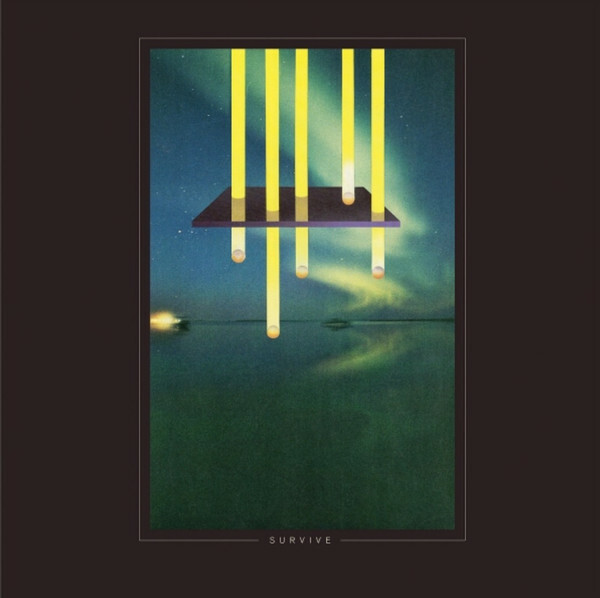 S U R V I V E are Michael Stein, Kyle Dixon, Adam Jones and Mark Donica and were formed in 2009 in Austin, Texas. It was Dixon and Stein who composed the musical score for Stranger Things rather than the band. As a band the quartet have been producing synth-heavy, horror-score-influenced compositions for almost a decade, via drum machines and analog synths.